Oktoberfest is almost here and it is that time when you need to think seriously about what to wear for the festivities. Do you have a Bavarian leiderhausen? Good for you but not to worry if you do not. There are online merchants from where you can get a variety of costumes for both men and women as well as accompanying party supplies to best match your ideas for the day. 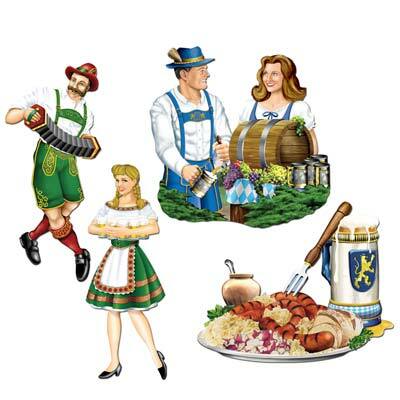 For the locals, large amounts of German beer and food is consumed during the festivities. While it is a time when people renew their commitment to unity, the festival also attracts visitors from other countries. What do you do to match the mood of the locals? If you just got into the mood last minute, take note of the colors; at least you will look like everyone else and still stay true to the spirit of the celebrations. The colors you will need to observe are black, red and yellow, the same colors you will find on the flag of Bavaria, Germany. If you can get your hands on Lederhosen and dirndls, then you will definitely blend into the mood as they are the traditional costume for the occasion. Last-minute-timers can also put on novelty T-shirts to replicate the mood. Music is an essential part of any traditional event and in the case of Oktoberfest, it brings back a sense of heritage and belonging. It would be great to have a local band performing at a party because they have been preparing for it and will appeal to the locals. To ensure that you land the best bands, it is best to book early to beat the demand. What if you are not in a position to afford a band? Do not break a sweat because even German oompah music played in an Oktoberfest party plays a major role in encouraging and entertaining guests. The spirit of Oktoberfest dictates that some songs must be written in the heart so most of the time celebrations are characterized by people singing along to bands and recorded music. In 1810, the first Oktoberfest celebration was held but within a wedding ceremony. The wedding was of one Ludwig, Crown Prince of Bavaria who was getting married to Princess Therese von Sachsen-Hildburghausen. The fact that everyone who was a citizen of Bavaria at the time got an invitation to the wedding brought the entire community together. Today, beer, music, horse racing and games grace the events. Oktoberfest is your excuse to plan a beer party. This entry was posted in Oktoberfest and tagged Oktoberfest, Oktoberfest party tips on October 1, 2017 by Mercurian.